Massive open online courses made a strong entrance into the education scene around the turn of the decade. Universities and companies around the world have created open online courses for the world to take advantage of on platforms like edX and Coursea– which have only existed for the past three years. Some five years on, where are we, in terms of success and lessons learned? It's now not just about MOOCs success in isolation, but also about in-class experiences shaping MOOC planning and design, and MOOC's shaping in-class experiences. Stanford University was the first to begin teaching MOOCs in their current form. Stanford hosted three MOOCs in 2011: a machine learning course hosted on Coursea, an introductory level course to artificial intelligence on Udacity, and a course on databases which is no longer listed. Nowadays Stanford is in the middle of hosting 16 courses with three more beginning soon. The edX platform has 500 courses that users can view. Other notable institutions have created course content available to the public and started to investigate the potential of MOOCs to educate the public within the last three years. Harvard and MIT founded the edX course platform in the fall of 2013, and enlisted nine other universities like the University of California, Berkeley and Georgetown University to fill the platform with high quality content. Different universities are grappling with other ideas of how to best use modern technology to teach today’s students. Arizona State University, for example, now offers 49 completely online undergraduate degree programs for their Sun Devils. However MOOCs are proving to be one of the most dominant trends in the higher education field. In a MOOC, one or more university professors teach a college-level course which is available to anyone with an internet connection and the desire to learn. Students are able to take a course at their own pace, and can drop out of the class with no consequences. The University of Texas System got into the MOOC trend in 2013 as one of the nine contributors to Harvard and MIT’s edX platform. So far the university has created 10 courses for global students, with one more course currently in the works. However since becoming part of the MOOC trend, university officials have realized that it cannot focus narrowly on creating MOOCs in order to improve the education that it offers to students and the community at large. “MOOCs remain one part of the Institute for Transformational Learning’s strategy to make a UT quality education more accessible, affordable, and successful,” Executive Director Steven Mintz said. The Institute for Transformational Learning is a University of Texas operation focused on improving the education opportunities provided by the university. The university launched a large scale course redesign project four years ago, and that’s when the university began looking into the MOOC concept. University of Texas Vice Provost for Higher Education Policy and Research Harrison Keller is one of the officials spearheading the movement to integrate technology and education. The university hosted it’s first set of MOOCs during the fall 2013 semester. Two years later, the university has been able to collect and analyze data from every MOOC it has hosted. This new data has allowed the university to improve the courses that it has created thus far, and change how it approaches developing future MOOCs. One major problem that Keller hopes to correct is the single platform nature of MOOCs. Keller wants the university to develop course content that can be taught on multiple platforms, in the classroom and online. He also believes that these MOOCs need to become more tailored to their audiences, and that they need to be designed in a way that facilitates reuse after the course is over. The University of Texas’ experiments with MOOCs has also brought some changes into specific classes on campus. Professors who develop these open online courses bring new teaching insights back into their normal lecture classes. “Our in class experiences have shaped our MOOC and our MOOC has shaped our in class experiences,” computer science professor Margaret Myers said. Myers has been committed to running a linear algebra MOOC with her husband and son during the spring, but she also teaches a statistics class in the fall where she incorporates MOOC-style techniques into her course. She uses short, five-to-ten minute videos to explain statistics concepts to the class, and then uses class time to go over problem sets and help students further understand the material. Of course the university course isn’t overly similar to a MOOC. There are still hard deadlines, penalties for dropping the class, and grades that have a very real effect on student’s GPAs. The linear algebra MOOC that Myers teaches is showing another way that these online courses are influencing standard university courses. Normally students would need to buy an expensive textbook for the linear algebra course, however with the introduction of this MOOC students have an alternative to the textbook. Students are able to review concepts discussed in class by watching videos and doing problem sets provided by the MOOC. 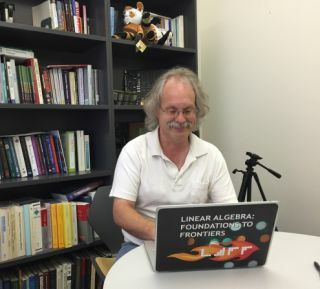 University of Texas at Austin Computer science professor Robert van de Geijn working on material for his MOOC, Linear Algebra: Foundations to Frontiers. Overall MOOCs haven’t created much wide spread change around the UT campus. Technology and teaching methods of professors remains largely the same as they were pre-MOOCs. Many professors are taking varying approaches to incorporate technology into their classes to better reach students independent of MOOCs. Some stick with powerpoint slides accompanying lectures, some have flipped their class by putting videos of their lectures online, and others have started teaching online-only courses. The meaningful changes that MOOCs have had on regular university courses can be seen when MOOC teachers transition back to teaching an in person course. These professors are generally better able to include technology like videos and online discussion boards into their classes to help improve the student’s learning experience. Teaching a MOOC allows professors to better understand how to reach and keep a student’s attention in order to effectively communicate their lesson. Professor Myers learned this lesson quickly after she started teaching her linear algebra MOOC. She saw that students weren’t paying enough attention to hour long lecture videos, so she broke down her video lessons into five-to-ten minute clips that allow students to break down the information without exceeding their attention span. Despite the challenges to MOOCs that have arisen over the past two years, Keller believes that major research universities will continue to produce these courses. However, he said some of the courses will be free to the public, and some will be paid for. These online courses will not be taking money away from in-person university lecture courses any time in the near future, but they will influence how some professors structure and include technology in their courses.